Some locations are well known for certain types of unusual activity, hosting a higher than average amount of reports of either UFO, cryptid, or other strange phenomena. The southern Pennsylvania area of Chestnut Ridge is seemingly such an area, as Invasion on Chestnut Ridge, the latest terrific documentary from director/co-writer/producer Seth Breedlove and the Small Town Monsters crew, relates. Invasion on Chestnut Ridge recounts, for starters, the well known Kecksburg UFO crash of December 1965, in which many witnesses claim to have seen a fireball streaking across the sky and then landing. Some say that a military presence arrived soon thereafter; several people recount reports of a metallic, acorn-shaped object being sighted. Wherever alleged UFO crashes occur, Men in Black and official cover-up accounts are usually not far behind, and the documentary presents stories of these, as well. But that is only the beginning of area’s high strangeness, as a rash of Bigfoot sightings occurred in the area in the early 1970s, including accounts tying the cryptid legends with alien spacecraft. Other weird beasts and sightings are also discussed, but I’ll save those surprises for future Invasion on Chestnut Ridge viewers. As with Small Town Monsters’ previous four films, Breedlove and company Invasion on Chestnut Ridge sets the scene nicely with some local color and area history. Alleged witnesses and other interview subjects are treated fairly, and are allowed to explain their personal encounters with or theories of the unknown in an even-handed manner. Breedlove and his crew also offer views from historians and researchers to shine further light on what may have happened in this vast, forested region. Invasion on Chestnut Ridge is a thought-provoking, wonderfully shot documentary that avoids sensationalizing its subject matter, focusing instead on presenting historical and eye-witness accounts, along with charming looks at the bucolic areas in which they occurred. The filmmakers occasionally use animated recreations of beastly encounters, or some other special effects touches to create a properly eerie mood. These are done in good taste and keep things intriguing. Small Town Monsters’ previous documentaries are Minerva Monster (2015), Beast of Whitehall (2016), Boggy Creek Monster (2016), and The Mothman of Point Pleasant (2017). 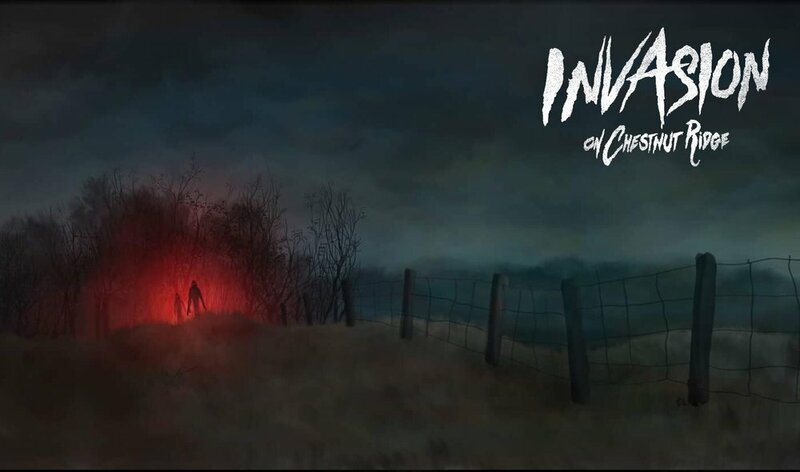 Invasion on Chestnut Ridge is a fine introduction to this filmmaking group’s body of work, and should appeal greatly to both Fortean enthusiasts and curious newcomers to the subjects. or their Facebook page at https://www.facebook.com/smltownmonsters/ or on Twitter at @SmlTownMonsters.